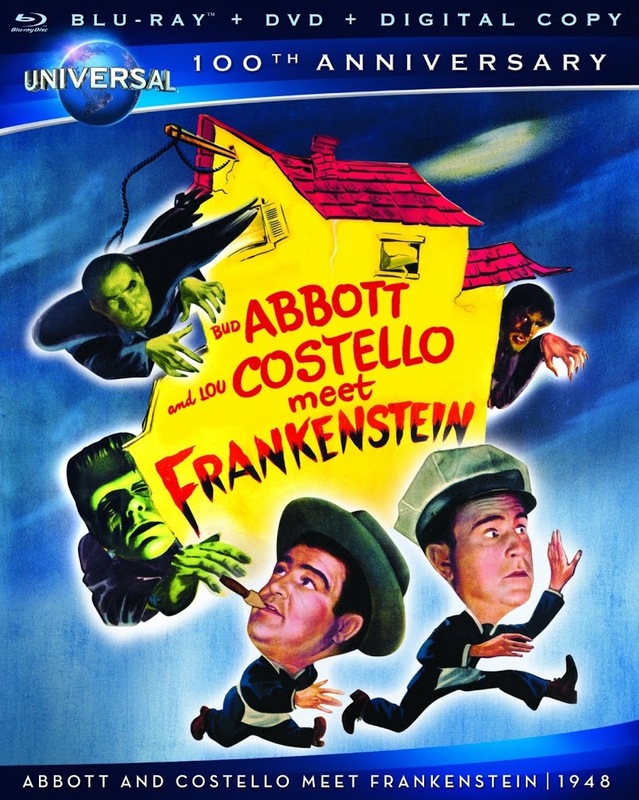 Article first published as Blu-ray Review: Abbott and Costello Meet Frankenstein on Blogcritics. Still funny 64 years after its 1948 release, Abbott and Costello Meet Frankenstein is a mash-up of two of Universal’s most enduring franchises. Comedic duo Bud Abbott and Lou Costello’s popularity had peaked after a series of more than 20 films beginning in 1940. Universal’s classic monster movies (begun in 1931 with Dracula and Frankenstein) had already run their course as well. House of Frankenstein (1944) and House of Dracula (1945) were last gasps before the studio moved past its venerable early monsters. 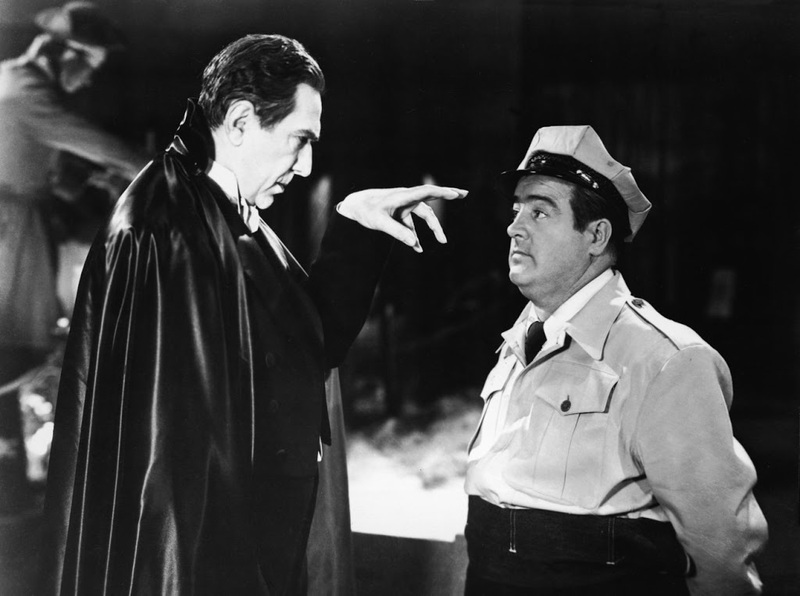 The unlikely combination of Abbott and Costello meeting the classic monsters—Dracula, Frankenstein’s monster, and the Wolf Man—was a stroke of genius that audiences couldn’t resist. Universal was so pleased with the box office results, the teamed Abbott and Costello with an increasingly outrageous variety of similar mash-ups that carried on well until the mid-50s. But never again would the magic displayed in Meet Frankenstein be captured again. Now on Blu-ray, the film that has been called one of the greatest horror-comedies of all time looks better than ever and will hopefully reach a new generation of fans. The best thing about Meet Frankenstein was Universal’s decision to cast their original Dracula, Bela Lugosi as Dracula (his first and only reprisal of the role he became famous for in 1931), their original Wolf Man, Lon Chaney Jr. (who first portrayed Larry Talbot in 1941’s The Wolf Man), and Glenn Strange as Frankenstein’s monster. Too bad Universal couldn’t get Boris Karloff to play the monster, but at least Strange had portrayed him in the aforementioned House of Dracula and House of Frankenstein. Rather than hamming it up, these actors play their roles completely straight, as if this were just another horror film. In large part, that is why Meet Frankenstein works so well. The plot is more of a framework upon which director Charles Barton hangs a series of sight gags. Chick (Abbott) and Wilbur (Costello) are working as baggage handlers when a shipment arrives for a wax museum, McDougal’s House of Horrors. 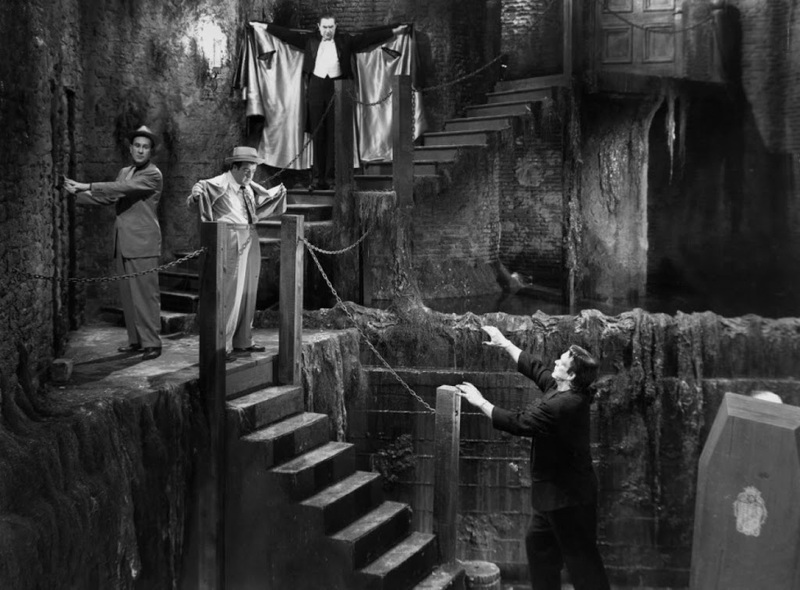 Larry Talbot calls to warn Chick and Wilbur that the two crates contain the actual bodies of Dracula and Frankenstein’s monster. Not heeding the warning, they deliver the crates to the museum, unload them, and unwittingly allow the monsters to begin wreaking havoc. Dracula has a plan to replace the Frankenstein monster’s brain with Wilbur’s. After making Dr. Sandra Mornay (Lénore Aubert) his assistant by turning her into a vampire, Dracula sets out to realize his evil plan. Talbot, the only one who knows that the Count and the monster need to be stopped, shows up on the scene. Of course, the full moon presents Talbot with additional challenges. The whole thing marches briskly forward to a showdown between Chick, Wilbur, and the trio of monsters. Less wordplay-oriented than earlier Abbott and Costello classics, Meet Frankenstein relies mainly on physical comedy and the novelty of seeing the comedy team interacting with the iconic villains. It’s all fun to watch and the 83-minute running time glides right by. The movie looks terrific on Blu-ray. Of course being a 1948 production, the image is framed at 1.33:1. The black-and-white cinematography by Charles Van Enger is richer, with deeper blacks and more nuances in the shades of gray, than on the standard DVD. Grain is a little inconsistent, but never excessive nor completely absent. Very minor print damage, such as minor scratches or dirt specs, pops up infrequently. The DTS-HD MA mono soundtrack is solid for the simple fact that dialogue, music, and effects are clear and well balanced. It’s a bit thin, and some of Costello’s shouted lines have the tiniest bit of distortion, but given its age it all sounds perfectly fine. Nothing new in the way of special features, but at least Universal ported over the material present on the old DVD. A consistently informative commentary from film historian Gregory W. Mank is included, along with the half-hour “Abbott and Costello Meet the Monsters” documentary. There’s also a standard DVD included. While it isn’t Abbott and Costello’s funniest film (I wouldn’t even call it their best horror-comedy, with that honor going to 1941’s Hold That Ghost), Abbott and Costello Meet Frankenstein remains a very enjoyable film and a great tribute to the early Universal monster movies.